The Tsunami Fender from Lowbrow Customs bolts right in place of your stock rear fender (cutting rear fender struts required) on your 1994 - 2003 Harley-Davidson Sportster and instantly changes the look of your bike. The Tsunami Fender is the go-to choice for tracker style bikes whether for the street or hooligan races on the dirt track. The heavy aluminum construction gives you many options between paint or polish, ready to rock right out of the box. This installation of this fender is a simple bolt-on process for 1994 - 2003 Sportsters. It can also be made to fit 1982 - 1993 Harley Sportsters, though it requires modifying the Tsunami fender by drilling some new mounting holes and trimming the sides. 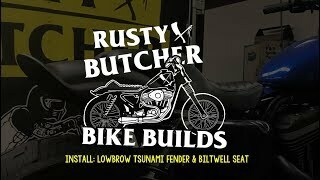 View Custom Fitting a Lowbrow Tsunami Fender to a 1982-1993 Harley-Davidson Sportster for all of the details. Excellent choice for a quality selection of motorcycle parts! Ive been purchasing Lowbrow parts for some time now and I keep coming back to them because the quality and type of parts selection are top notch! I like the style of parts they cover especially the bobber and cafe racer vintage looks. They always have some kind of part I could use in on of my builds regardless of what make or model bike it is or what kind of build Im doing. Lowbrows is definitely a long time go to place for fenders, gas tanks, and other chopper hardware. I’m a Union Metal Worker by trade, this is top notch grade craftsmanship! I may have been able to fan my own, just don’t have the right equipment. Looks Great. Fit Great! Thank you! This fender is rad, feels sturdy, looks awesome. Very nice fender, required very little work to prep it for paint. Looks very good on the bike and just bolts right on. The only thing I would have changed is I wish it would have been made from steel.